Introduction - The E.S.C. Resources CWS-8001 non-contact Coating Weight Thickness Gauges provide fast and reliable on line top, bottom and total thickness measurements and SPC reporting for strip material. The direct benefits provided by this measurement are documented compliance with quality specifications, improved process control and improved production. The standard system provides disk storage for the SPC information to eliminate the need to maintain large files of printer paper for long term record keeping purposes. Principal of Operation - X-Ray Fluorescence, this uses the scientific principle that matter will generate unique energy levels in proportion to it's composition and coating. As the material passes between the X-Ray source and detector, variations in coating cause measurable variations in the amount of x-ray energy returning to the detector. The gauge is calibrated based on these variations, and provides a continuous, non-contact, accurate and reliable measurement of thickness. System Display - in it's normal mode of operation, the 17" full color monitor displays actual coating, deviation, upper and lower tolerance limits, shutter status, coil footage, and a graphic display of coating for the complete coil. The coating display changes from green to red if the coating goes out of tolerance. Additional display screens are provided for I/O status and trouble shooting diagnostics. Easy Installation - no requirements for cooling. "O" frames typically mount on two pedestals and require a minimum of cabling. 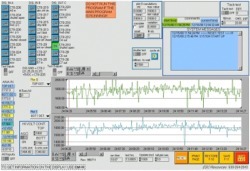 Accuracy - state of the art high speed electronics and logarithmic linearization performed by the software assures highly accurate measurements of various materials while minimizing the hardware requirements. Reliability - this system uses a modern personal computer, providing a software based system that reduces the requirement for peripheral hardware. 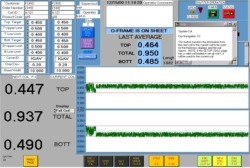 This arrangement provides a very reliable "platform" for coating measurement and SPC reporting. 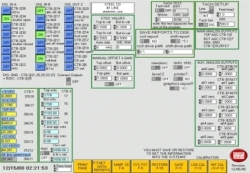 I/O Capabilities - hardware is provided to enable communication with a host computer or process control unit. Automatic Standardization - this provides a fast, accurate standardization cycle. Up to 10 calibration curves are available to permit measurement of a wide variety of material types. Diagnostics - system faults are stored and displayed on demand. A description of the fault and possible corrective action is also displayed. Upgradeable - this system is software based, which enables future upgrades to be performed in the field, via software changes by the customer. This page is used to customize the system and to test all inputs and outputs. Oscilloscope display can be used to monitor analog inputs and detector head input. On Line Help Pop-up windows provides information on function or parameter. Coating Deviation Plot - presents a graphic representation of strip coating over the coil length, in a strip chart fashion. Also indicates location of out of tolerance material. 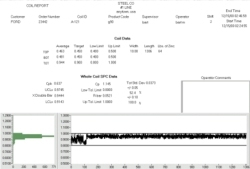 Coil Report - presents a histogram of coating distribution, footage, average coating, UCL, LCL, X Double Bar, R Bar and CPK. Shift Summary Report - presents a shift summary of production. Note: No optional equipment is required for disk storage of the Coil Report and the Shift Summary Report. In addition, both of these reports are customer formattable on site. 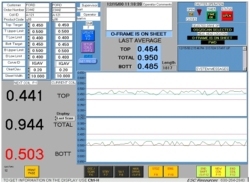 Remote Operators Station - allows for multiple coating weight displays. Other Options - other options are available depending on your specific needs. Range: Galvanize, Galvalume, Galvaneal, Aluminum, Tin, Terne and other specialty elements on a steel substrate. Air Gap: 1.25" to 1.75" depending on the product measured. To request additional information on the E.S.C. Resources CWS-8001Non-Contact Coating Weight Thickness Gauge please click here: Information Request Form.